Without a doubt, the Chase Ultimate Rewards program is the most popular travel rewards programs on the market among points and miles aficionados — and for good reason. With tons of ways to earn Ultimate Rewards points, the program is arguably the best credit card rewards program currently available, and it should be a top priority for anyone who wants to book award flights. Once you have tackled earning some points, you can redeem Ultimate Rewards for award flights or hotel award stays across the world. Let’s dig into what the Ultimate Rewards program has to offer so you can start putting together your next amazing vacation! What Is the Ultimate Rewards Program? What are Chase Rewards Points Worth? Chase Ultimate Rewards is a credit card rewards program that allows cardholders to earn points with every purchase. These points can be redeemed a variety of ways but the best redemption option, by far, is for travel. Any of the other options such as redeeming for a statement credit or merchant gift cards is a poor use of these valuable points. To earn Ultimate Rewards, you must hold an affiliated Chase credit card. Once you are approved for a Chase card that earns Ultimate Rewards, you will be enrolled in the program automatically. The number of points you earn on purchases depends on which card you use and under what category the purchase will code. Each Ultimate Rewards card has bonus categories that allow you to earn between 2X and 5X points per dollar on many purchases. With the right combination of Chase cards, you can earn tons of Ultimate Rewards. The key to earning Ultimate Rewards is the combination of Chase cards you choose. You can easily transfer Ultimate Rewards points to one of their airline or hotel partners once you have enough for a flight or hotel stay. Keep in mind, you must hold at least one premium Ultimate Rewards card to transfer points to airline and hotel partners. You can combine Ultimate Rewards points from any cards that earn them to really boost your account. Get up to $600 per claim in Cell Phone Protection against covered theft or damage. Are you a business owner? For more detail, see our Chase business credit cards article, or in-depth business credit card guide to make an ideal choice for your situation. Hot Tip: If you’re ready to get started and earn a ton of points quickly, check out how to earn 100k Chase points in 90 days! The Chase Sapphire Preferred® Card is the most popular Chase card thanks to its popular bonus categories. Holding this card also allows you to transfer Ultimate Rewards to travel partners. Earn 2X points per dollar on all your travel and dining expenses including flights, hotels, Uber, restaurants, bars, and more. Gas stations are not included in the travel bonus category. Dining includes all restaurants and dining establishments, including bars, but does not cover other food-related expenses such as supermarket and grocery store purchases. You will earn 1X point per dollar on all other purchases. The Chase Sapphire Preferred® Card has an annual fee of $95. This is one of the two travel rewards cards from Chase that gives you additional travel benefits that you can’t get with cash-back cards. Hot Tip: Each Chase card that earns Ultimate Rewards comes with a sign-up bonus that will really boost your points balance. The Chase Sapphire Reserve® is the latest premium card offering from Chase. It is an enhanced version of the Sapphire Preferred® Card as it earns 3X points per dollar on travel and dining purchases and 1X points per dollar on all other purchases. 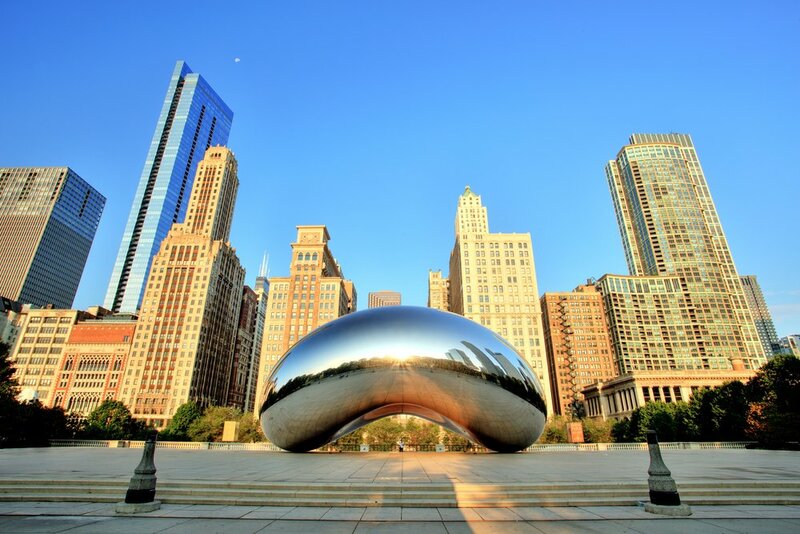 It also comes with a wide range of benefits including Priority Pass Select lounge access, a $300 travel credit per cardmember year, a $100 to cover the Global Entry application fee, and more. Because this is a premium card, it costs $450 per year. Consider this Chase’s answer to The Platinum Card® from American Express. The classic Chase Freedom® is a cash back card but the points can be combined with those from one of the premium Ultimate Rewards cards (i.e. one with an annual fee). This card is known for its quarterly bonus categories that allow you to earn 5% cash back per dollar on up to $1,500 in spending in a variety of categories. When paired with a card such as Chase Sapphire Preferred® Card, the 5% becomes 5X points and even more valuable. The quarterly bonus calendar changes each year, but typically covers categories such as supermarkets/grocery stores, transportation, gas stations, holiday shopping, and restaurants. Each year, they also have specialty categories that go along with them. For instance, 2016 introduced wholesale clubs during the same quarter as restaurants, offering big savings on all food purchases. 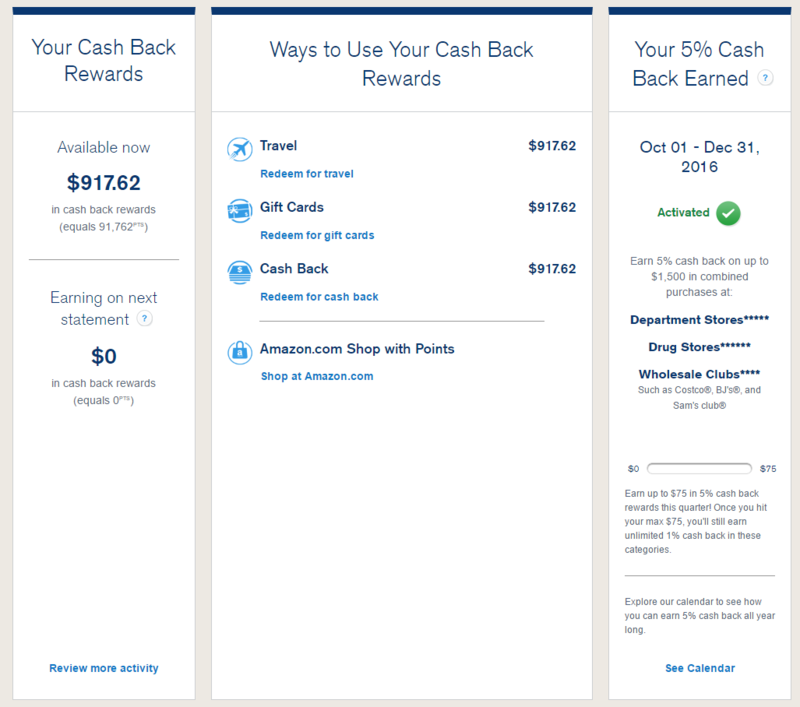 Last year, Amazon.com was on the 5% cash back list for the holiday quarter, and it is expected it will again with the fact that Chase and Amazon now have a direct partnership. The Chase Freedom® earns unlimited 1% cash back on all other purchases and has no annual fee. In 2016, Chase released the Chase Freedom Unlimited®. Unlike other Chase cards, it does not have bonus categories. Instead, it earns unlimited cash back at a flat rate of 1.5%, among other useful benefits. Like the Chase Freedom®, when paired with a premium Chase card, this 1.5% becomes 1.5X points per dollar. In a sense, this card turns every purchase into a bonus category so you’re always earning the maximum number of Ultimate Rewards possible. There is no annual fee for the Chase Freedom Unlimited®. The Ink Business Preferred℠ Credit Card is similar to the Chase Sapphire Preferred® Card and Chase Sapphire Reserve®, but the card is tailored to small business owners. It carries the same travel rewards benefits as the Chase Sapphire Preferred® Card and has the same annual fee. The Ink Business Preferred℠ Credit Card earns 3X points per dollar on the first $150,000 spent on combined purchases on travel, shipping purchases, the Internet, cable and phone services, and advertising purchases made with social media sites and search engines each account anniversary year. You will earn 1X point per dollar on all other purchases—with no limit to the amount you can earn. The Ink Business Preferred℠ Credit Card has an annual fee of $95. The Ink Business Cash℠ Credit Card is the no annual fee small business card option from Chase. It is tailored to new business owners as a cash back card, rather than travel rewards card. The card earns 5% cash back on the first $25,000 in combined purchases at office supply stores and on the Internet, cell phones, landlines, and cable TV. You will also earn 2% cash back on the first $25,000 in combined spending at gas stations and restaurants. All other purchases will earn 1%. As with Chase’s other no annual fee cards, when paired with a premium card, the 2% and 5% become 2X and 5X points per dollar. This is a great card for small business owners, offering cash back bonuses in many categories with no annual fee. For additional information on the perks associated with this card, read up on our article featuring the many benefits of the Ink Business Cash℠ Credit Card. Bottom Line: With the right combination of Chase cards, you can earn tons of points thanks to the numerous bonus categories. The Chase Shopping Portal offers bonuses of up to 25x! Earn the most points per dollar by shopping at the Chase rewards mall when shopping online. Choose from more than 240 stores with unlimited earnings of 1X to 6X bonus points per dollar just for going through the portal to shop! The bonus points you can earn are on top of any bonus categories on one of the Chase Ultimate Rewards cards. For example, if Staples offers a bonus of 2X points per dollar and you use the Ink Business Cash℠ Credit Card, you would earn 5X points per dollar thanks to the office supply store bonus category and 2X bonus points per dollar for using the Chase shopping portal. That’s a total of 7X points per dollar! You can also maximize earnings by using the Chase Freedom® in department stores when they are included in the quarterly bonus category plus any bonus points offered through the Chase shopping portal. Using the Chase Freedom Unlimited® is a smart choice for all other purchases that don’t include a category bonus since it earns a flat 1.5% (or 1.5X points) per dollar. Be aware that you must use the link provided in the shopping portal and make your purchases during the same visit in order to receive these points. There are also restrictions on using coupons and other types of deals. The following is a table of available partner stores in the Chase shopping portal and their bonus earnings. The list is not exhaustive and the bonus rates are subject to change. The Chase travel portal is for more than just flights. You can also book, cars, hotels, and activities! Use the Chase travel portal to book flights, hotels, cars, and activities. Booking travel-related activities through the Ultimate Rewards travel portal lets you earn at the same rate as your cards. 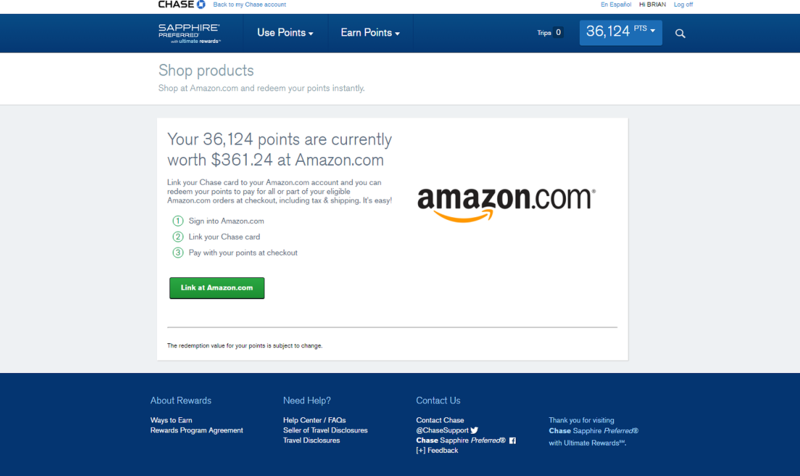 Prior to 2016, Chase offered a bonus point for each dollar spent, but this is no longer available. This means you’ll earn 2X points on the Chase Sapphire Preferred® Card. You will earn 3X points when using the Chase Sapphire Reserve® or Ink Business Preferred℠ Credit Card. Booking through the Chase tool works similar to any other booking tool. It does not have as powerful of features as the ITA Matrix or Google Flights, but most prices are the same. To ensure you get the best price when searching for airfare in the Chase rewards travel tool, make sure to compare it to at least two other site’s results before booking. Without the extra point earned, it actually makes no difference if you book through the tool or another travel site. One advantage of booking through the portal is that your loyalty program information can be stored in the system and you’ll automatically earn miles when you book. Practically speaking, Chase buys the ticket on your behalf. Remember that you can input all your travel information into your profile, so if you are using the tool frequently you won’t need to re-input that information each time. Keep in mind, if you book a hotel stay through the Chase travel portal, it’s unlikely your elite status will be recognized by the hotel and you are unlikely to earn hotel points for your stay. Hotels almost always require you to book directly with them to earn points and receive the perks of your elite status. We all like to share things we like with our friends, but it’s even better to get a reward for it! You can earn between 5,000 and 10,000 points simply by referring a friend to a Chase card, with a maximum of 50,000 points in yearly earnings from referrals. Chase’s Refer a Friend page. Once you input your details, it will display your referral bonus, if available. The Chase Sapphire Preferred® Card Referral Page. You can earn 10,000 points for a referral! If you have difficulty with the referral link, call customer service. Hot Tip: Send your friends the referral link via email and encourage them to get started to earn your bonus points! The ways you can redeem your Ultimate Rewards points is determined by which cards you have. Travel rewards cards offer all the same redemption benefits as cash back cards, but not the other way around. We’ll discuss all the ways you can utilize your rewards, but if you’re looking for specific travel redemption options, check out the best ways to redeem Chase points for travel! Having the Ink Business Preferred℠ Credit Card, Chase Sapphire Preferred® Card, and Chase Sapphire Reserve® allows you to transfer Ultimate Rewards points to travel partners which are almost always the best ways to use your points. 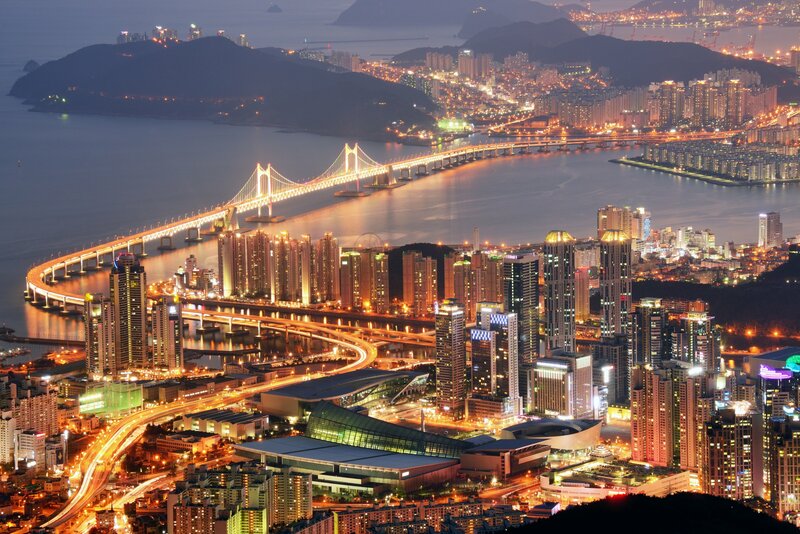 Transferring points to airline and hotel partners will often be the best use of your points. To transfer points, go to the “Use Points” menu option and select “Transfer to Travel Partners” from the drop-down menu. This brings you to a page where you’ll select the loyalty program and a number of points to transfer. You will need the login details of your desired loyalty account (or you will need to create one). The information in your travel profile must match the personal information in your desired loyalty account. You cannot transfer points to accounts of other people unless they are a member of your household. The transfer, like all point transactions, can take up to 6-8 weeks. However, many are completed almost instantly or within 24-48 hours. You must transfer a minimum of 1,000 points, and can only transfer in 1,000 point increments. Once completed, points cannot be transferred back into your Chase account so make sure you want to transfer the points! These loyalty reward programs cover each of the major alliances and offer many ways to use your Chase points. If you have the Ink Business Preferred℠ Credit Card or Chase Sapphire Preferred® Card, your Ultimate Rewards points are worth 1.25 cents each when booking travel through the Chase travel portal. The Chase Sapphire Reserve® provides the best deal through the travel portal as each point is worth 1.5 cents each. 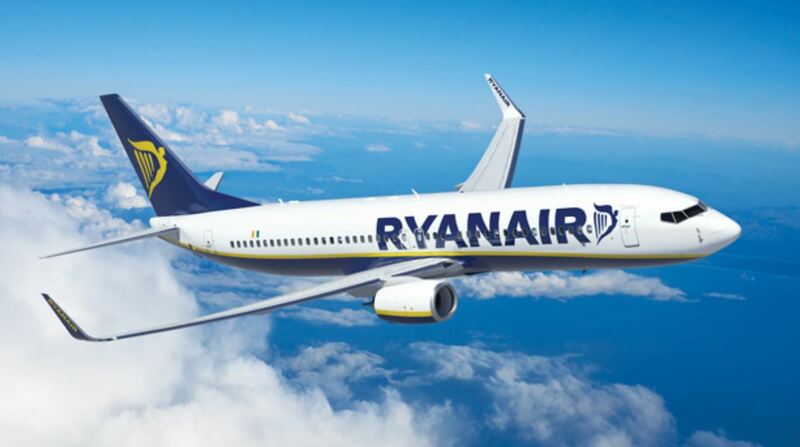 If you have this card and are booking an economy ticket or hotel stay, make sure you compare the points cost of transferring versus booking through the travel portal. Sometimes, the travel portal will actually be the better way to go. The Chase Experience option, also known as Exclusive Events, is great if you’re looking for alternative ways to use your points. Chase curates exclusive experiences that you would likely not be able to access on your own. The main screen of the Chase Experience Portal where you’ll find a variety of unique and potentially valuable redemption options. Check back often for exclusive offers and redemption values as they are updated on a regular basis. It is hard to do a true or general valuation on the Exclusive Events portal since they are unique experiences and one person may value it differently than another. Dining options available in the Ultimate Rewards Experiences portal. You should compare the dining offers to those offered through Restaurants.com (via the Chase shopping portal for bonus points). You can pay for these offers with cash or points at a value of $0.01 per point. Keep in mind that the Experience Portal is a separate domain, and once you’ve been transferred there you must manually navigate back to the Ultimate Rewards site. You will possibly be prompted to input your login information a second time when you return to the Ultimate Rewards site. All cards have four basic redemption options. Each redemption in these categories offers the standard redemption value of 1 cent per point, with a higher value in specific areas. Don’t use your hard-earned points as a statement credit at 1 cent per point. 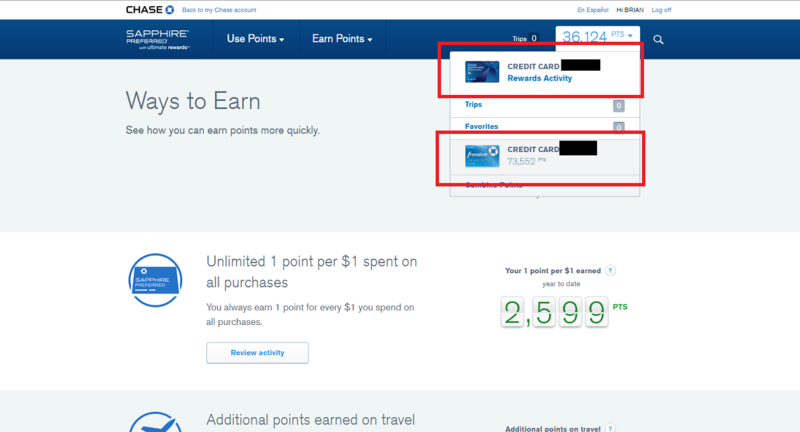 Chase lets you use your points as credits on your statement at $0.01 per point. Simply transfer your cash-back earnings to your balance as a statement credit. To redeem for statement credit, click the “Use Points” option on the Ultimate Rewards home screen, and then click “Get Cash Back.” The minimum redemption amount is $20.00, or 2,000 points. From the same screen, you can also make a direct deposit into your bank account. Click the “Select an Account” drop down at the bottom of the page. Keep in mind that direct deposits may be considered income and require you to report it to the IRS. Cashing out your Ultimate Rewards this way is a poor way to redeem your points. 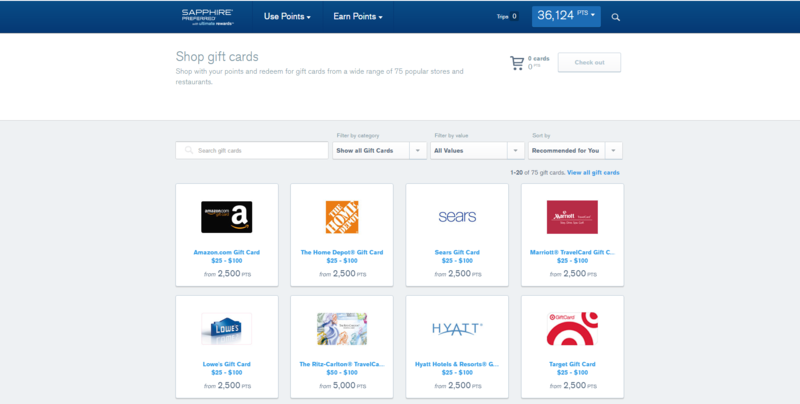 Chase offers a variety of gift cards for which you can redeem your points. You can redeem your cash-back earnings for gift cards to places where you normally shop such as iTunes, Lowe’s and more. Most options are valued at 1 cent per point. However, some gift cards offer a better value. For instance, Kohl’s gift cards are offered at a 10% discount or 1.1 cents per point. This is an awful way to use Ultimate Rewards points. We don’t recommend redeeming Ultimate Rewards points for gift cards. 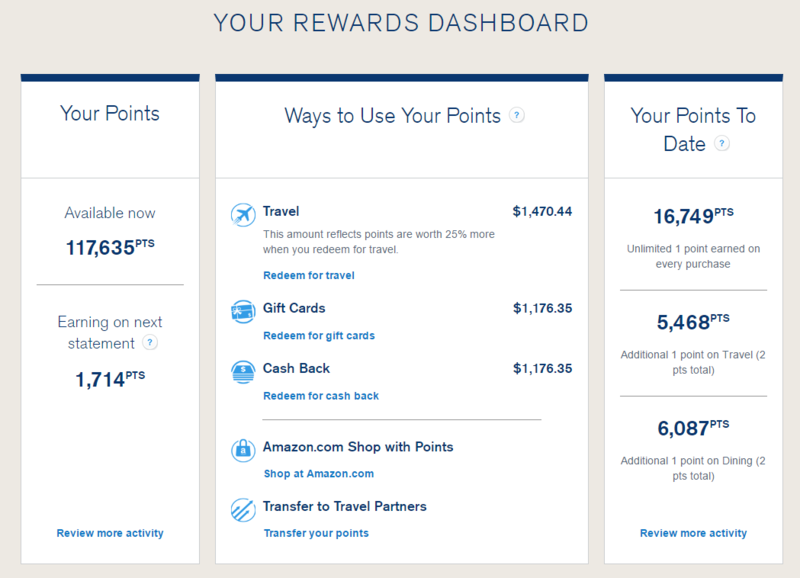 Chase is now partnered with Amazon.com for merchandise redemptions, but it is a terrible use of points. Chase Ultimate Rewards now partners directly with Amazon.com for merchandise redemptions. This means you can shop directly on Amazon’s website, rather than go through the Chase shopping portal. Before September 1, 2016, your Chase points were valued at 1 cent per point on Amazon and were debited upon shipment of the product. Now, 125 points are worth $1 for a value of $0.008 per point, which is a bit lower of a value. You can also combine your points with cash or other payment methods. Amazon also gives you the option to link your Chase and Amazon accounts at any time, including at the time of checkout. This is a terrible use of Ultimate Rewards points. While they are not technically travel rewards cards, you can still use cash back earnings from your Chase Freedom®, Chase Freedom Unlimited®, and Ink Business Cash℠ Credit Card when you book flights, hotels, cars, and other activities. The caveat is that the value of these points is still valued at 1 cent per point. The Chase travel portal works the same whether booking rewards or booking with cash. At the time of your purchase, Chase gives you the option to use your points to offset any portion of the ticket you want with points. Pay fully in points or combine your points with dollars when purchasing travel from the Chase portal. Do yourself a favor and combine your Ultimate Rewards points from a no-annual fee card with a premium Chase card so you can get outsized value from your points. Now that we’ve discussed how to earn tons of Ultimate Rewards points and redeem them for maximum value, let’s review how to navigate the Ultimate Rewards site. The photo background on the login screen will change depending on your location. The photo here is of Austin, TX. From the login screen, click on “Ultimate Rewards”, which is found on the left sidebar in the new website design. Once inside the account summary section, click on “Ultimate Rewards” in the bottom left-hand corner of the screen. Screenshot of the Chase Rewards login page, which takes you directly to your Ultimate Rewards account. Once you log in, select the card you want to view and you’ll be directed to the home page for that card. After you log in, you’ll be prompted to select a card. The home page screen of any of your credit cards lets you view your earned and available points, your transaction details, and which points will appear on your next statement. You will also find information on how to use your available points and how to earn more points. The new Ultimate Rewards dashboard, which shows you a variety of stats associated with your card. Options for gift cards to use points. Options for shopping to earn points. Options for things to do to earn/use points. 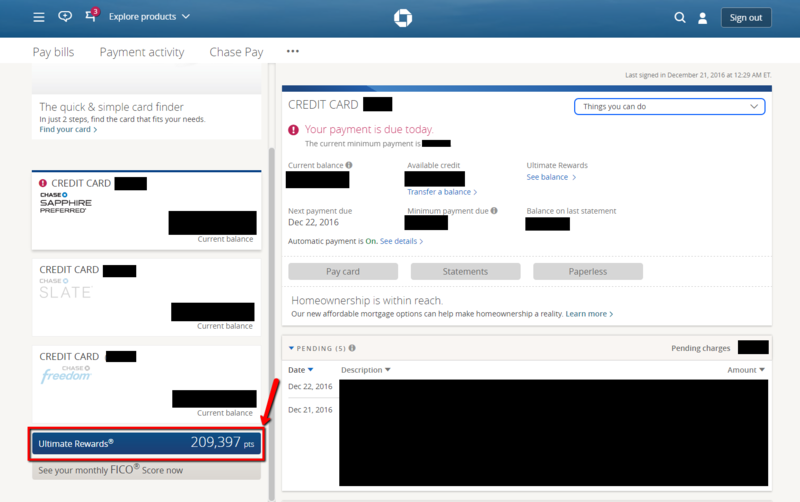 With Chase’s new dashboard in Ultimate Rewards, it’s easy to check the bonus category spend on Chase credit cards. Simply sign into your Ultimate Rewards page for whichever card you want to check, and check out your dashboard. The right-hand column will have data for your current spending on your cards. You can see the status bar for your spending in the bottom right. In this example, no money has been spent this quarter in the bonus categories! What a shame. If you want to view information associated with another card, simply click on the card from the drop-down menu on the top right. Quickly navigate between cards using the drop-down menu at the top right of the page. Create Chase Travel Profiles to more quickly book Chase rewards travel through the Chase travel portal. Combine your Ultimate Rewards points by using the menu at the top of the screen and selecting “Combine Points”. From this main screen, you can also combine all of your points onto one card. Your points will need to be combined under the Chase Sapphire Preferred® Card, Chase Sapphire Reserve® or Ink Business Preferred℠ Credit Card so you can transfer to travel partners. Select “Combine Points” from the upper right menu under your total points, and you will be guided through the process. Hot Tip: If you are thinking about closing one of your Chase cards, be sure to spend any outstanding points or transfer them to another card beforehand to avoid losing them forever. Chase follows the industry standard when points are used for basic redemption. In this case, each point is worth 1 cent. However, when you use your cards to redeem travel rewards via the Chase travel portal, the value of each point increases to a minimum of 1.25 cents or 1.5 cents per point. When you transfer points to any Chase reward travel partners, the redemption value of each point can be worth even more with some redemptions at up to 5-8 cents per point for international first and business class options. Unlike standard rewards programs that cancel your points if your accounts are inactive for 6-18 months, your Chase rewards points never expire, as long as your accounts are open and in good standing. This is similar to the other bank rewards programs like American Express Membership Rewards and Citi ThankYou Rewards. Once you cancel your account, the points are forever lost. However, you can product change your card to a no annual fee Chase card. It’s pretty clear that you can get some great travel by earning and redeeming Ultimate Rewards points, but how do they compare to other transferable points programs? So, which program is better: Ultimate Rewards or American Express Membership Rewards? Each program features credit cards that earn points that can be spent in similar ways. Both programs have their pluses and minuses. For instance, there are more Amex credit cards (12+) that can help you earn Membership Rewards points. Chase only provides 6 credit cards that earn Ultimate Rewards. Membership Rewards also has more travel partners with 20 total. Ultimate Rewards only has 13. However, when used correctly, both cover most airlines and awards through the various alliances. Chase also has the advantage of a partnership with the World of Hyatt program. One advantage of Ultimate Rewards is the shopping portal. 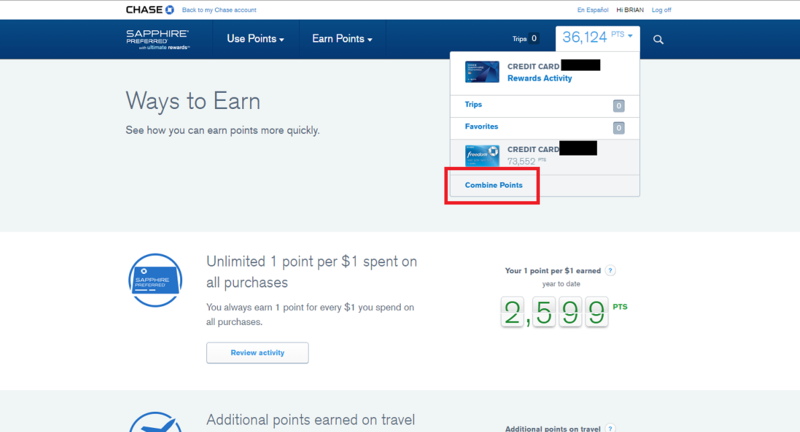 American Express no longer has a shopping portal you can use to earn additional points, although they do have American Express Offers. You will be charged a small fee of $0.0006 per point (maximum of $99 per transaction) to transfer Membership Rewards to U.S. carriers. There are no fees to transfer to international carriers. While starting with Ultimate Rewards is probably your best move, Membership Rewards should be high on your list. There are tons of ways to redeem Membership Rewards for some fun travel. While Chase provides several cards that earn Ultimate Rewards, you can earn Marriott points with cards from American Express and Chase. Transfers from Ultimate Rewards process almost instantly in many cases, while transferring Marriott points can take days, and sometimes over a week. However, Marriott has over 40 airline transfer partners and can be used to book hotel stays as well. 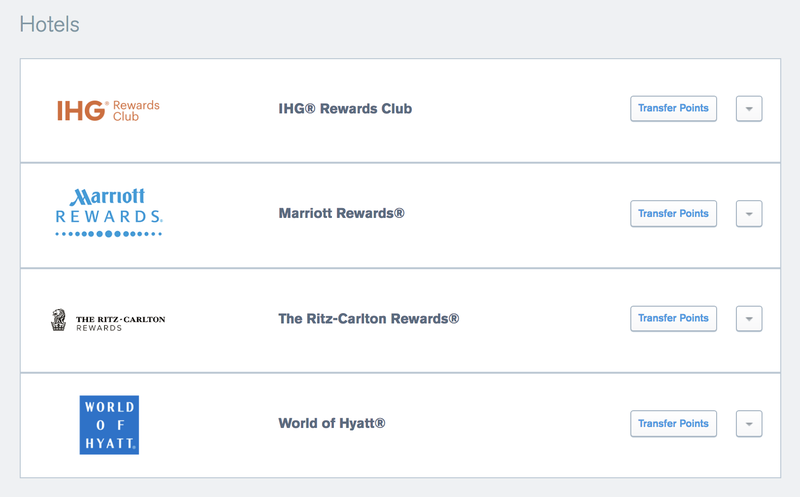 Similar to Membership Rewards, Marriott points should be a priority after Ultimate Rewards. While the transfers can take a bit longer, there are some amazing ways to redeem Marriott points for some amazing flights and hotel stays. Finally, we have Citi ThankYou Points. This program isn’t as well known as the other transferable points programs but you can redeem ThankYou Points for some awesome travel experiences. You can transfer ThankYou Points to 13 airline partners or Hilton (though, this isn’t advisable), but not all transfer at a 1:1 ratio like Chase. There are only three cards that earn ThankYou Points and only two of those allow transfers to travel partners. This can be a very useful program down the line but is definitely not a priority compared to Ultimate Rewards. When applying for Chase cards, keep in mind the 5/24 rule. If you have opened 5 or more cards (not including most business cards) in the last 24 months, you will not be approved for a Chase card. For that reason, these are almost always the best cards when you are just starting as they allow you to accumulate points that can be used to fly with tons of different airlines thanks to their airline transfer partners. On top of that, you can transfer to Hyatt for some amazing Hyatt redemptions. With six cards that can help you earn Ultimate Rewards points and some amazing redemption options, you’ll be glad you learned about this program. What is Chase Ultimate Rewards? It’s a loyalty program developed by Chase that rewards customers for for using their credit cards. By signing up for a card in the Ultimate Rewards family, you can earn points on your purchases and redeem them for rewards. Awards vary from gift cards to merchandise to travel. Points can be used along with travel rewards cards to earn a 20% discount in the Chase travel portal, or transfer points to travel partners at a 1:1 ratio. How much are Chase Points worth? The value of your Ultimate Rewards points depends on how you redeem them. For redemptions using cash-back cards, or for purchases outside of travel rewards, the value is typically $0.01 per point. When you redeem your points using Chase’s exclusive travel rewards portal, their value increases to $0.0125 per point with the Chase Sapphire Preferred® Card or Ink Business Preferred℠ Credit Card. If you transfer points to a Chase travel partner, you can push the value of the points to over $0.02 per point to redeem international travel rewards. How do you use Chase Ultimate Rewards? Once you are approved for any one of the seven Chase UR cards, you begin earning points immediately simply by using the card. All points earned accrue in your Ultimate Rewards account and never expire as long as your account is open and in good standing. When you are ready to redeem your points, the Ultimate Rewards Portal offers various options and suggestions for using your points. How do you earn Chase Ultimate Rewards points? Points can be earned through purchases on your credit cards, each with specific bonus categories. Depending on the card, you can earn bonus points for travel, dining, office supply stores, department stores, hotels, restaurants and more. Earn additional bonus points by shopping at the Chase online shopping mall, which has over 200 merchants offering from 1-25x bonus points just for using their online shops. You also earn points through huge sign up bonuses — the easiest way to earn lots of valuable points. To receive the bonus you must meet a minimum amount of spending, which varies per card, within the first three months. How do you use Chase Ultimate Rewards points? Chase points can be used in various ways. You can get cash-back on your statement, or make direct deposits into your bank account. You can also use points for gift cards, or through Amazon.com for general merchandise. The Chase Sapphire Preferred® Card or Ink Business Preferred℠ Credit Card offer the great value for the travel rewards portal. You can get a 20% discount for using the travel portal with points, or you can transfer the points to your favorite loyalty programs. Using the Chase Sapphire Reserve® gets you a 50% discount! Finally, you can use your points in the Chase Experience portal to book unique experiences that you would not be able to access otherwise. Who are the Chase Ultimate Rewards Partners? 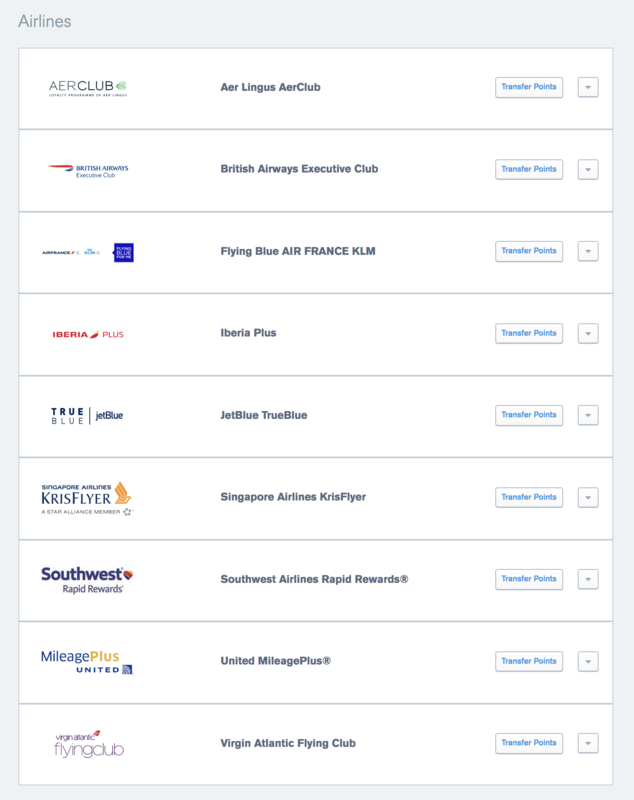 Airline partners include Air France KLM, British Airways, Iberia, Aer Lingus, JetBlue, Singapore Airlines, Southwest Airlines, United Airlines and Virgin Atlantic. Hotel partners include Hyatt, IHG, and Marriott. What is the Chase Ultimate Rewards Phone number? Call 1-866-951-6592 to reach a Ultimate Rewards travel agent. Call the number on the back of your card for all other inquiries. Brian's first ever airplane ride was in a private turbo-prop jet. He was merely an intern boy trying to make a good impression, but it turns out the plane made an impression on him. It wasn't until Brian relocated to Dallas, TX, and moved in with an American Airlines employee that he truly discovered how incredible travel could be. Great article! Lots of good information in it. Do you know if it is still possible for someone to transfer points from his/her card to their spouse’s account? For instance going from Chase Freedom to Sapphire Reserve. I know Chase recently did an update to their rewards policies, but not sure if this is something they disabled. Hi Cesar! Funny enough we just published an article on this topic – The Ultimate Guide To Transferring Flexible Points To Other Accounts [Amex, Chase, Citi, Marriott]! For Chase Ultimate Rewards, you’re only able to transfer points to an account that belongs to you, or your spouse or domestic partner, provided the spouse or domestic partner is an authorized user living at the same address. And – you can only make transfers to one authorized user on your account. Hope that helps!